Description: Perhaps the most anticipated California Family Law ruling of 2014, In re Marriage of Valli (2014) 195 California Supreme Court, S193990, 58 Cal.4 th 1396, 171 Cal.Rptr.3d 454, 2014 FA 1640), helped put to rest the tensions between two conflicting presumptions – that of Cal. Evidence Code §662 (title presumption) vs. Cal. Family Code §2581 which presumes property acquired during the marriage is community property. 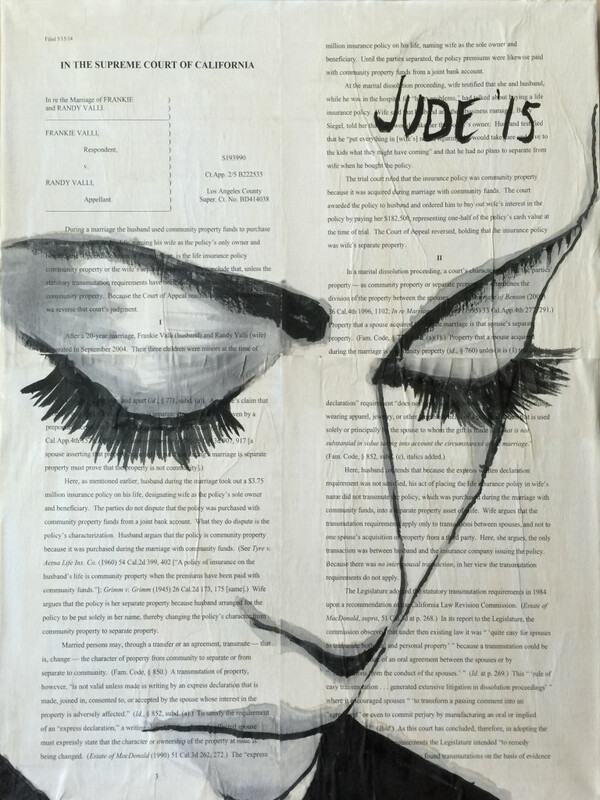 This piece of artwork uses pages from the ruling stained with coffee and painted with calligraphy ink. The title of the art work “Exhibit 1: Big Girls Don’t Cry” is aptly derived from one of litigant’s (Frankie Valli) songs.